Why You Should Drop Everything and Travel to Kyrgyzstan Now! KYRGYZSTAN is Switzerland of Central Asia as they say but after my visit to Kyrgyzstan, I would say Switzerland is Kyrgyzstan of Europe. I planned my Central Asia trip solely because of Kyrgyzstan but added Uzbekistan and Kazakhstan as I go along. My trip to Kyrgyzstan was full of surprises. 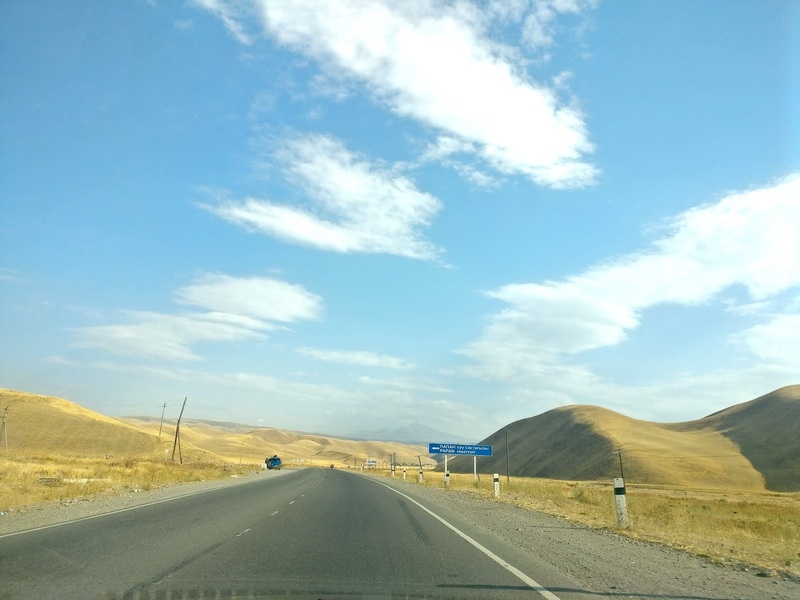 I had many first time experiences in Kyrgyzstan such as First time land border crossing, Staying with a local family in a Village, My first trek, My First Hitchhiking experience, Celebrated my birthday outside India for the first time. Kyrgyzstan is a hidden gem. You should visit the place as soon as possible before it gets flocked with tourists. Approx. 80% of the country is covered with mountains. Kyrgyzstan is one of the world’s least densely populated country. It is a landlocked country shares its borders with Uzbekistan, Kazakhstan, Tajikistan & China. It is one of the few countries to use a currency with the denomination of 3 som. One of the World’s largest alpine lakes and glaciers i.e. 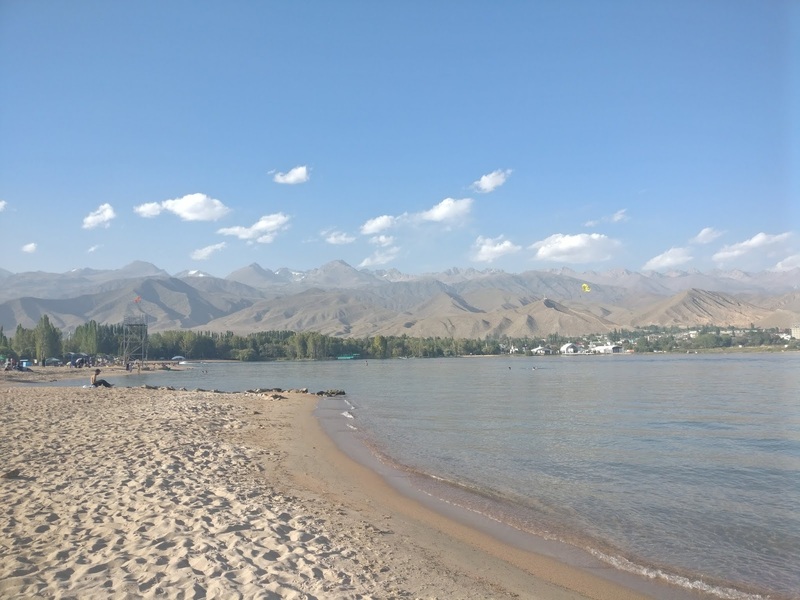 Issyk-Kul and Inylchek are in Kyrgyzstan. Kymyz is a popular drink in Kyrgyzstan made with Mare’s milk slightly mixed with Alcohol. Unlike their neighbour Kazakhstan, Majority of Kyrgyz people prefer living in a rural area(Nomadic way of Life). Kok-Boru is the national sport. It can be described as Polo with Carcass. More on this below. World’s largest walnut forest is in Kyrgyzstan located in the Jalal-Abad region. Kyrgyzstan’s railway network(Approx. 400 Kms) is one of the shortest in the world due to its mountainous terrain. I entered Kyrgyzstan via Osh border. It was my first ever land border crossing and a pretty smooth one. I spend 2 nights in Borbash village before catching a flight from Osh to Bishkek. I spend 2 nights in Bishkek before heading to Karakol. 2 nights in Karakol. 2 Nights in Cholpon Ata. 1 night in Bishkek. On the way to Borbash Village! I spend 2 nights with a local family in a Kyrgyz Village. It was my second Couchsurfing experience after Uzbekistan. After crossing the land border from Uzbekistan, I catch a taxi to reach my Host’s Village i.e. Borbash in Kyrgyzstan. I was his first guest from India and he was really happy about this fact. When I entered his home, I saw Bollywood songs playing on his TV. He smiled and acknowledged the same. The first word that came out of his aged father upon seeing me was “Raj Kapoor” (Legendary Indian Actor/Filmmaker)! My host understands little English but really keen to learn it. 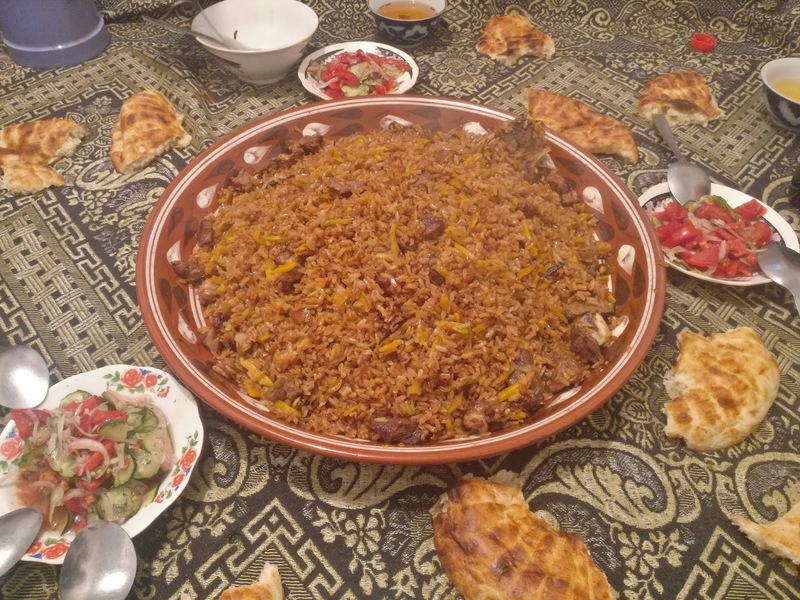 He pampered me with delicious Kyrgyz food, culture and hospitality. We went exploring nearby mountains, villages and had authentic local food. I also played snooker with his brother which I clearing sucked at! The two nights I spend with my host and his family was truly memorable. My host is married with three children. Their smiles are still engraved in my mind. Kyrgyz hospitality is nothing short of Indian hospitality. My host and his brother run a bakery from home and supply the goods to the nearby city. My host dreams of opening a guesthouse one day. It was easily the best experience of my trip to Kyrgyzstan. 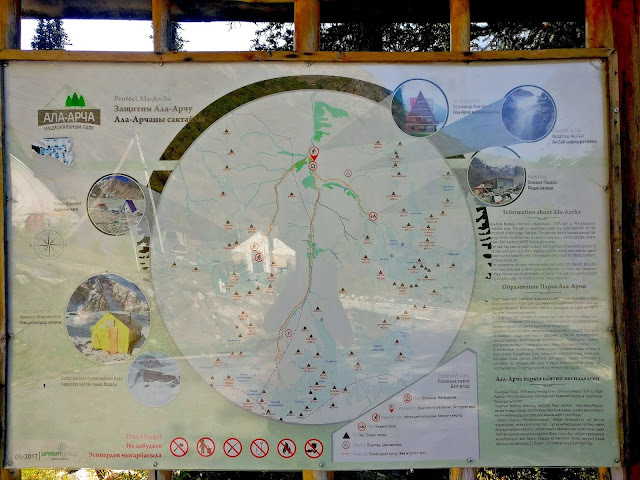 Ala Archa National Park is located 40 Kms away from Bishkek City. The cheapest way to reach the park is by catching a shared Marshrutka(Mini bus) from Osh Bazaar, Bishkek. It takes more than an hour to reach the entry point of the park. From the entry point, one needs to catch a taxi to reach the main gate of the park. For solo travelers, it can be expensive. Luckily, I met two French guys and we shared a taxi to the main gate. The ride was 10-15 mins long. There are many things to do in the park. Check the map above. I decided to trek to the waterfall in the mountains with French guys. It was the first trek of my life but an unsuccessful one. French guys were too fast and I couldn’t keep up and left alone. I tried to continue on my own but soon gave up. Now, when I think of it I could have easily done it but maybe it was the first time hitch which stopped me. The view to the point I trekked was absolutely stunning. After I get down, I followed the river trail to the view of beautiful mountains. Due to time constraint, I can’t able to explore the rest of the park but it is definitely a must visit. Did Lunch while looking at this view. Total bliss! After Bishkek, I traveled to Karakol. It was approx. 6 Hrs journey. 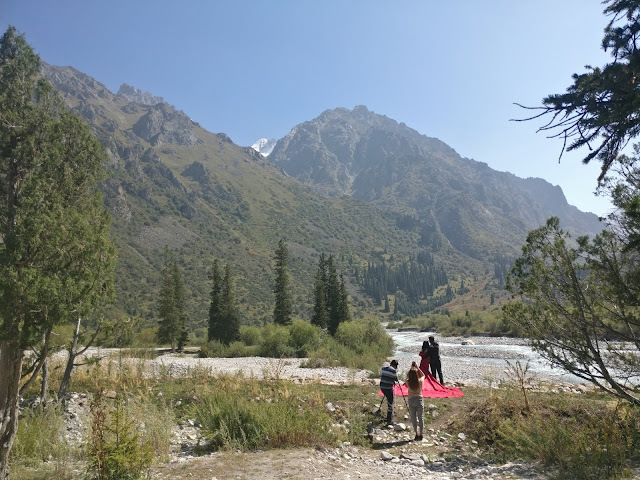 Karakol is most popular for trekking and for the same reason I traveled there. After my previous unsuccessful attempt, I pushed myself to give it one more try and the result was truly memorable. I decided to trek in Jeti Oguz. The trek starts from Jeti Oguz(Seven Bulls) rocks formation. I set my aim to reach the waterfall located somewhere inside the mountains. It was a plain and dusty road for a while. After crossing 4 bridges, I reached the mesmerising view of the mountains. Here people are living in Yurts (Traditional Kyrgyz house). After I crossed the 5th bridge, I took the right turn in search of the waterfall. After more than an hour, I finally found the waterfall. It was a magical feeling. I did my lunch on the top of the mountain with a dreamy view: Lush green mountains, Beautiful yurts, Cool breeze, clear sky. I never wanted to leave this place. After spending precious half an hour, I started my descent. I plugged in my earphones and complete the journey while singing the Hindi lyrics alongside. Foreigners look at me with utmost attention while a local identified a song and sing along! It was approx. 5 hrs trek for me. No fees for trekking. One can also hire a ride to reach the bottom of the mountains and then hire a horse to ride into the mountains to reach the waterfall but if you can, I would highly recommend to ditch both modes of transport. With my first ever trek, I was bitten by the trekking bug and subsequently mounted the highest peak in Maharashtra once I got back home. World Nomad Games is the reason behind my trip to Central Asia. I read about the event online and were quite fascinated by it. It was World nomad games which introduced me to this region. It was the 3rd edition of this sporting event held in Cholpon Ata. Cholpon Ata is 2 hrs ride from Karakol. It is absolutely free to watch a match at World Nomad Games. I managed to see two sporting events. The first one I saw was the Kok-Boru tournament. Kok-Boru is the sport kinda similar to Polo. Instead of putting a ball into the Goalpost, one need to put Goat Carcass into the round shaped Goalpost(see pic above). Did I say similar? 😉 It is hugely popular in Central Asia. Kyrgyzstan team played brilliantly. They won the final against Uzbekistan with a huge margin. At one point the score was 11-0. The final score was 32-9. Second one I saw was the wrestling tournament. It was an exciting and sometimes goosebumps-inducing experience. During breaks, we were entertained by the beautiful folk music. 16 wrestlers from different countries were competing for the title. Wrestlers from Russia and Iran reached the final. I was rooting for the Iranian wrestler from the beginning. He did exceptionally well but in the end, the Russian wrestler won. 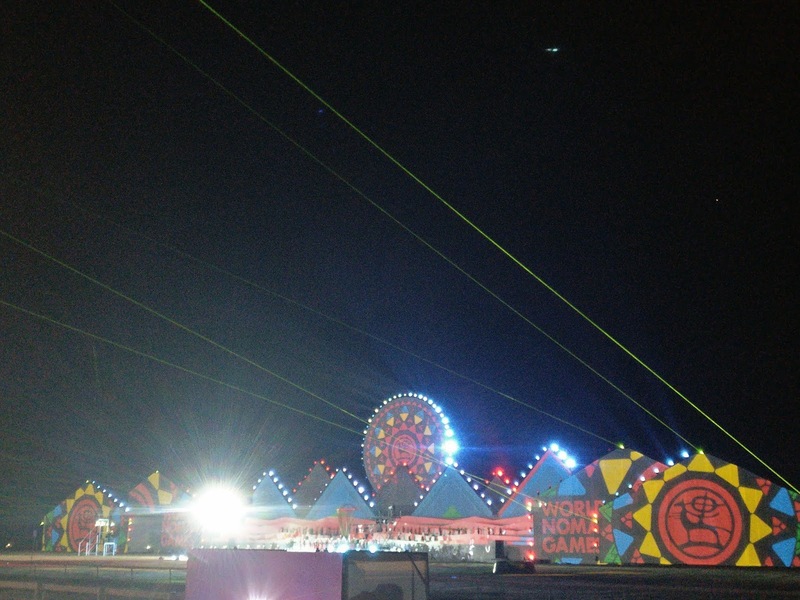 I attended the closing ceremony of World Nomad Games. Attending the closing ceremony is not free. The show started with the usual bureaucratic speeches but soon delve into song and dance sequences. It was like watching a Bollywood night in a foreign language with a laser show. Even though I was unable to understand a word they’re singing but the music and the atmosphere sets my foot tapping. And I’m the last person in any event to dance! People were truly enjoying the night. It was a perfect birthday night for me. Yep, that’s right. Check below for complete details! I celebrated my birthday abroad for the first time ever i.e. 8th September. It was truly memorable for unorthodox reasons. I was in a land known as Kyrgyzstan where no one knows me, forget about my birthday. Strangely I felt good about it. Maybe cause I’m an introvert. I decided to buy some cookies and distribute them among the people I met during the day. So at the end of the day, I got birthday wishes from policeman, Security guard, Waitress, Hawker, Bus driver, group of kids, people who helped me with directions… It was a great feeling. I spend the majority of my day at Lake Issyk-Kul. Even got a discount by showing my ID proof for parasailing as a birthday gift 😉 After the quiet and fulfilling day, I do have a loud party at night when I attended the closing ceremony of World Nomad Games. It is one of the most memorable birthdays of my life. Now, you must be curious about the questions like How costly is Kyrgyzstan, Language barrier, Food, Transportation, Visa, Currency, SIM cards. Well, worry not. I got it all covered. I wrote a detailed post about it here: Practical Guide To Central Asia. I’ve never been to Kyrgyzstan, omg the place is gorgeous!!! I so wanna go now, it kinda reminded me of Nepal. Thanks a lot for the post. these picture are simply stunning and ove how you were able to experience so much while you were in kyrgzstan! ive actually never heard of it but def love hearing about your fabulous trip! I learn about Kyrgyzstan from my recent trip to Xinjiang China as there are a small minority living there. I got pretty interested with their culture. I love your compilation of the list and facts. It sounds so fun to have a homestay with the local family. May I know how do you find the homestay and how much per night? Does it include meals? What an amazing adventure, you certainly had a lot of firsts out there! I can’t believe how mountainous it is out there. Wow…lovely photos and an inspiring piece. The scenery is not something I’d associate in my mind with that part of the world…so this has been eye-opening. Great post – thanks for sharing! I’m absolutely spell bound by the scenery and the unique experiences you had. It sounds like you took this trip solo, which also amazes me. I don’t think I would have that courage, but I envy you. You definitely painted a picture of a place I would love to visit one day. Thank you for your post! This sounds like an amazing adventure. From the hikes to mingling with the locals, I would love to do something like this! And I have never had an interest in this country, more so because I don’t know much about it. I just tweeted your post so I can go back to it for info. Thanks for the info!! I love mountains & truly this place is absolute bliss. I am surely going to visit this awesome destination. That is such a beautiful place. Those mountains against that sky are breathtaking. It looks like I’m adding another destination to my bucket list. It sounds like you had a wonderful birthday trip! Your host family sounds lovely. I’m glad you were able to complete a trek. 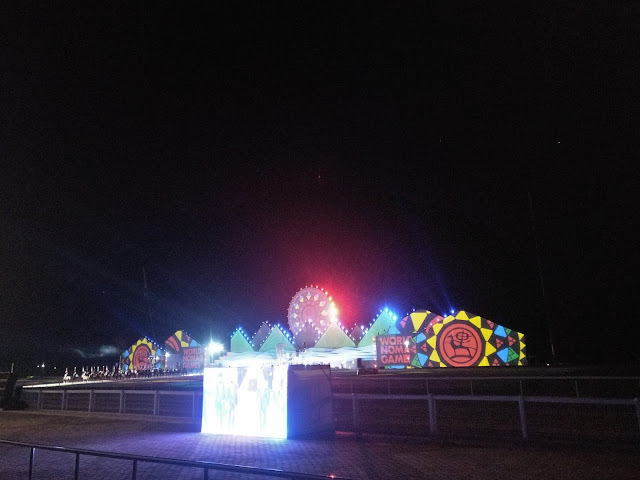 The Nomad Games seems like a cool experience! Never been to this place and my first time to hear but it looks really wonderful that makes me wanna go there soon. This really looks like a destination I would enjoy. I love the scenic views. I wouldnt mind hiking up to some of these mountains. Krygystan has been on my list for a while now but havent come across a lot of bloggers with stunning visuals like these. What beautiful scenery! It’s great to see all the photos, as it’s like being on a virtual tour. And wow, that eagle is HUGE! You don’t really realize that when you watch eagles at a distance, but standing on someone’s arm … wow! Wow, Kyrgyzstan looks really cool! It looks a little bit similar like Turkmenistan! Whoa! Kyrgyzstan has always been a dream destination for me. Hopefully i get to visit it someday. Wow.. The landscapes of Kyrgyzstan is incredible. Truly the Switzerland in Asia! Kudos to you for trying so many firsts on this trip.. 🙂 Sounds like you had an amazing time! Lots of firsts for you on this trip! It seems like an awesome place to visit. I am blown away by the description of Kok-Boru! I can imagine this is a game that has been played for ages and ages. Very interesting! Congradulations, on compleing your first trek. I usually hike when I travel. The walnut forest would have been a must see for me. Looks like you had a great trip. I took time reading this article, it was really engaging. I didn’t know anything about Kyrgyzstan before but now I can say I have a little idea about it. S, thank you for this article. Amazing photos! My closest friend is from Kyrgyzstan. I hope to visit the country with her one day. Oh my! what a beautiful country! I happen to live in the “Kyrgyzstan of Europe” but the real Kyrgyzstan looks much more interesting! Happy late birthday!!! 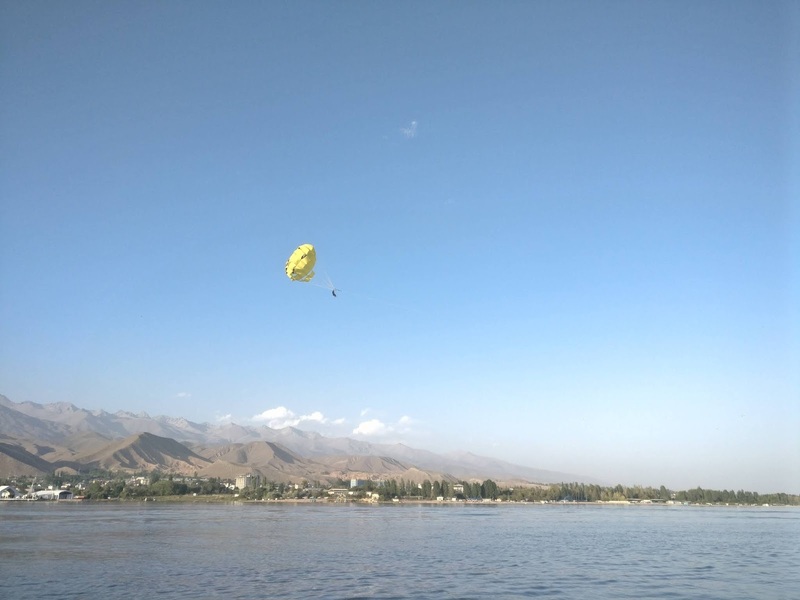 I have never been parasailing and it looks like a blast! I enjoyed reading and learned so much! Thank you! What a unique trip and way to spend your birthday! It seems like you got a truly authentic taste of Kyrgyzstan, especially with the family stay and events like the Kok-Boru tournament. I have never thought of visiting Kyrgyzstan, but you have me intrigued. Your post awake a great memories of my trip to Kyrgyzstan last year. I really miss the people, the stunningly beautiful spruce forests, the yurts and the snowy mountains there. 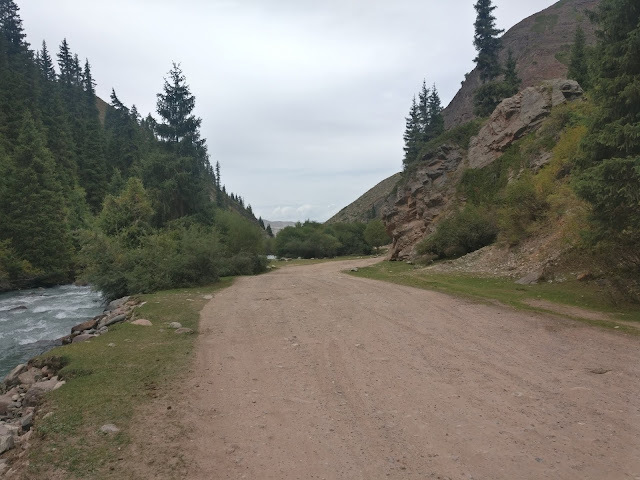 My favorite place was Altyn Arashan, near Karakol. Have you been there? Seriously so jealous you got to go here. 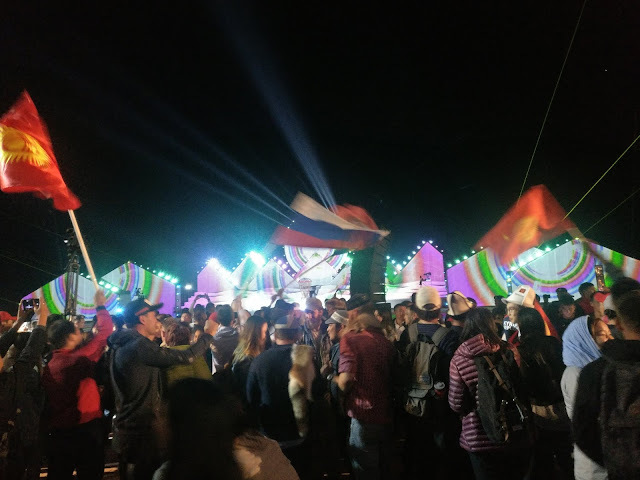 I went to Mongolia in 2016 and it looks like Kyrgyzstan has a very similar vibe. The landscapes are stunning but that is so amazing that you got to go to the World Nomad Games! What a truly incredible trip! I love loove love this. For some reasons I’m obsessed with mountainous areas and love the mountains too. I’m glad you had quite an experience here. One I’d give anything to have right now.